I had intended to write a full entry tonight, including getting started on the "How to do Apologetics" series. So, I was trying to put together a little logo, and I wanted to include a picture of No Doubt About It. Now, I have plenty of cover images, but for some reason (I don't remember what), I looked at its listing on Amazon.com, and--wouldn't you know it--there's another book there, entitled No Doubt About It. This edition came out in 2002, five years after the paperback version of mine, and this one was authored by Sheri Dew, a Mormon lady. What fascinates me about this book is the creativity that someone put into the title and cover art. How unique to start out with "NO" in really large letters, then decrease the font for "DOUBT" somewhat, and have "ABOUT IT" even smaller, with the author's name in really small print underneath it all! Well, I'm going to resist making any comments on how this example represents so nicely the state of Mormonism as Wanna-Be-Christianity. That would be insensitive. And I won't be so tactless as to point out that there is no parallel subtitle, e.g., "The Case for Mormonism" because the Church of LDS continues to try to obscure its identity, which is a telling commentary on the dilemma engendered by its pretensions. On the one hand, they want to be identified as Christian; on the other hand, they cannot possibly identify with historic Christianity because the angel Moroni is supposed to have said to Joseph Smith that, until he came along, all churches were false. So, Mormonism these days is trying to bring off the impossible: To be known as one part of the true church while denying that there is any true church other than themselves. That's definitely living in your own world. But some people think that such comments are impolite, so I won't violate good taste with them. If I did talk any more about Mormonism, it wouldn't be about the group itself--their history and beliefs are sufficiently bizarre to take care of themselves, and I don't have any magic glasses to read Reformed Egyptian. I would talk about the people who identify with evangelical Christianity, but who are actually attempting to do the job on behalf of the Mormons and try to twist Mormon doctrines into a Christian scheme. I would remind them that according to the Bible there is only one God, that Christ is uniquely the incarnation of God and didn't work himself up to that standing, that we are saved by grace through faith in Christ alone, and that the Bible (Gal. 1:6-9) specifically sets aside exactly the kind of heresy that revises the gospel on the basis of alleged angelic visits. But this is not the time for that. For now, I merely want to express my perplexity at this illustration of how imitation is supposed to be the highest form of flattery. Personally, I think that whoever did the cover art for that publisher either a) had seen the cover of my book and had his retinas permanently scorched by the luminescent green and orange or b) is ripping off his employer by collecting his weekly pay envelope for derivative creativity. None of that actually prevented me from writing a full entry. But I got myself into accidental trouble with other items. I wanted to make sure that the page on my website concerning No Doubt About It would be presentable, realized that I needed to do a lot of updating for it, used the page of Mysticism as a template, and promptly wiped out the Mysticism page. So, I had to redo the latter page from scratch. Therefore, we will start talking about apologetics next time. Part 1. The Risks of Meta-Apologetics. It is with a little bit of trepidation that I start this series because all too often discussions of apologetics turn into warfare on meta-apologetics. And so, if I start with meta-apologetics, who knows what might happen? By "meta-apologetics" I mean analyzing methods of apologetics, discussions of which wind up all-too-frequently with someone claiming the one and only right way of doing apologetics. Apologetics should be the defense of the truth of Christianity, but some people cannot help themselves but turn it into the defense of their particular method of apologetics. In the process, we waste an incredible amount of time and energy that should be devoted to helping other people see the truth of Christianity by debating methodology. And what's worse, people turn it into a matter of questioning someone's Christian faith. Let’s say we’re at an apologetics conference and things are going well. A number of speakers have pointed out the flaws with various non-Christian world views or made positive contributions in demonstrating the truthfulness of some aspect of Christianity. Everyone is learning from each other, or so it would seem. Then some nudnik stands up and declares that everything that we’re doing is unbiblical, pagan, and idolatrous because we’re not following the precise method of Apologist X. So now, instead of continuing to make progress on the important issues of the day, we wind up debating whether the distinctions that are so dear to the heart of X and his minions are really true, let alone significant. There is a time to do apologetics and a time to do meta-apologetics, but unfortunately there are some people who never get to apologetics because they are so busy picking on other Christians on issues of meta-apologetics. As an example, at the last ETS meeting I attended, someone presented a paper which was supposed to be a defense of presuppositional apologetics, but it actually was a denunciation of evidentialist apologetics, the bottom line being that evidentialism is unbiblical and sinful (I’m not exaggerating.) Needless to say, there was a flurry of discussion, and--believe it or not--I was involved in it. The speaker finally asked me the supposedly rhetorical question, "have you ever seen an evidentialist apologetics textbook that concludes with the gospel?" Of course, the answer was, "I can think of one; it’s called No Doubt About It.” I’ll let you figure out where, if anywhere, there is a sequitur in this exchange. So, whatever I'm going to do here, expect flexibility in methodology. I guess much of this is going to be meta-meta-apologetics. Next time: the purpose of apologetics. Apologetics is not evangelism. Evangelism means to present the gospel to someone in such a way that he or she can respond to it. Frequently, in order to make this possible, we need to prepare the way so that the people we are trying to reach will be in a position to hear and understand the gospel. As conventional wisdom tells us, starving or hurting people are not inclined to pay much attention to our recital of, say, "The Four Spiritual Laws" until they have been fed or healed. Not only for the sake of evangelism, but because we are called to represent Christ on earth, we should let people experience God's love through our hands. Many times the barrier is physical; sometimes the barrier is intellectual. This is where I really get confused by people who actually object to apologetics, like some of the faculty of IWU I talked to back in January. By "object" I mean exactly that; they think that it is wrong to do apologetics because to do so implies an imperialistic or uncharitable attitude. As I said in the entry of that day, it would seem to me that if someone is cold and needs a coat, we should do our best to find him a coat so that he will be warm. Similarly, if someone is confused and needs an answer to an important question, we should do our best to find him an answer so that he will see things more clearly. Not to do so seems to me to be the uncharitable option. Of course, first of all the potential apologist needs to be convinced that Christianity is true, and that there are answers to hard questions, and that the other person is being helped by getting the answer. 1 Peter 3:15 exhorts us to be ready to provide a "defense" of the hope that is within us. That doesn't mean that everyone needs to memorize all of the arguments in, say, Norm Geisler's Encyclopedia of Apologetics, but we should be able to point out to people why we think Christianity is true. Thus, apologetics stands in the service of evangelism. There are many times when evangelism does not need apologetics. A preacher presents the gospel, the Holy Spirit convicts a person of their sin and their need to be redeemed, and they respond to the Gospel. It would only beconfusing to give an argument for the existence of God to someone who already believes in God, or to demonstrate the truthfulness of Scripture to someone who already believes that the Bible is true. However, if someone questions the historical trustworthiness of the Bible, wouldn't it be a good thing to show the person that the Bible is, in fact, historically reliable? So, apologetics is driven by interpersonal contexts. The textbooks that we write and the courses that we teach can never be more than large maps that help us to get into the right direction, but when a person is really experiencing honest doubt or has honest intellectual questions, chances are that we need to do more than apply the relevant part of the book or system, but we must probably do a whole lot more homework in order to help the struggling person (--or to find answers for ourselves). Apologetics really is not a discipline of its own. It consists of all of the disciplines necessary to support the truth of Christianity positively and it requires knowledge of the subject areas that challenge Christianity. Thus, the ideal apologist should know everything; however, this is a somewhat improbable qualification. An alternative is to have at least superficial knowledge in many areas, but to concentrate on those areas where it is most likely that one is going to have evangelistic contact with other people. Thus, again, apologetics is not an end in itself. It follows that it is pointless simply to create a new system of apologetics. Whatever we do cannot just be an exhibition of creative thought, but must be helpful to someone needing answers. "Rev. Moody, I don't care for the way you do evangelism." A gentleman was reproving Dwight L. Moody one evening. "Ah, Sir, do you do evangelism?" "Well, Sir, I like the way I do evangelism better than the way you don't do it." I heard this story forty years ago on a James Kennedy tape, so I can't document it, but I like it. Substituting "apologetics" for "evangelism" also has some value. The problem is that in an attempt to be relevant and speak to the so-called post-modern world, any number of people these days try to "correct" traditional apologetics so that it isn't apologetics any longer. Of late, there have been numerous books published under the heading of apologetics that are extremely helpful in terms of teaching proper attitudes, the need for good relationships, strategic ways of presenting the gospel, and so forth. Much of this strikes me as both helpful and needed. As far as I know, friendship evangelism is still the most effective method of bringing non-Christians to Christ. Furthermore, we need to make sure that we keep focused on the content of the gospel and not just enjoy our clever arguments. So, I have a lot of appreciation for such books insofar as they contribute to the cause of evangelism. But, if they do not help in making a case for the truth of Christianity, whatever else they are, they're simply not apologetics. "You don't have to answer that question. You're entirely off the hook"
"evaluate them according to a universally valid standard." With all due respect, Stackhouse has bought into a strangely distorted form of argumentation here. After all, there is such a thing as logic, and if we know Christianity to be true, we can also know that any belief system inconsistent with Christianity must be false. Far be it from me to discourage anyone from studying world religions, but if you're sure that Christianity is true, you don't have to be an expert on all of the others in order to know that they are false. So, maybe the problem is not so much a comparative one as one of having reasons for the truth of Christianity by itself. how millions of people have found the claims of Christianity to be convincing. So, can you see why I get a little confused? Is he answering the question or not? If the staff member says all of the things above as objective evidence, he's answering it and doing apologetics. But if the idea is that he just basically presents his own personal testimony, that's great, but he's not answering the question, and he's not doing apologetics. So, as I said earlier, one doesn't have to do apologetics all the time. A solid argument resolving the problem of evil is unlikely to console a suffering person. We must take into account that there is an affective side to Christianity and that Christ changes people's lives because he is real. Sometimes (make that "many times") experiencing genuine Christian fellowship or authentic worship is more effective than a lot of arguments. But we lose credibility if we give affective answers to objective questions or respond with pragmatic methods to intellectual issues. I made a blatant appeal to logic above. But aren't there many kinds of logic? We'll take on that question next time. I really appreicate your affirmation that it is a part of our role as the Body of Christ to work to meet the needs of others--not because we want to convert them and not (always) because they are already part of our faith community. And I like your extending this to provide an explanation of what apologetics is and also a rationale for doing apologetics. This makes a lot of sense to me. The motive and aim of apologetic discourse, then, is (or should be) genuine love for the person with whom the apologist is communicating and a desire for the good of that person. The Christian apologist believes that answering the person's questions about Christianity is working towards her good. The aim is *not* properly to make oneself more comfortable by getting the person to sign on to a credal list that is identical to one's own belief system. This all seems very Socratic to me. I think the role of the apologist can be seen as a Socratic midwife. What is important is leading the other to truth for her own good; coercion doesn't work here. Socrates doesn't say: "You should believe this about x because it is what I believe and I am a model of wisdom concerning x." He says, "What do you think about this understanding of x?" Part 4. Logic, part a. Let me begin with a summary of what I've tried to say so far. To do so, I'm going to quote Scott C.'s post from the message board in the insert on the left, not because it contains accolades (though I'm not above appreciating them), but because he put things so well, better than some of my own formulations. We are now coming to the part that I've been looking forward to. As promised last night, I'm going to address the nature of logic a little bit since I invoked it almost ex machina in my discussion. Therefore, all penguins have wings. the validity of this syllogism does not derive from the fact that it follows the rules. The rules of a syllogism were established in order to describe its validity, which we recognize intuitively. Logical systems can become extremely complex, but normally the basic notion of validity is given, just as biology does not create living organisms. When a person formalizes logic, the system he creates must have certain properties. 4. It must have a semantic, which means that, once we assign truth or falsehood to statements within the system, there are rules by which further true statements are derived. Syntax and semantics can apply to individual statements. Syntax functions a lot like grammar. "Vijay and Vishal is on the cricket team" is bad grammar, whereas "Vijay and Vishal are on the cricket team" is good grammar. Similarly, in traditional categorical logic, a correct formulation might be "All insects are non-vertebrates", whereas "All insects are not vertebrates" is not a wff. Identity: a = a. A thing is identical with itself. And (P → P). If P is true, then P is true. Contradiction: ~(P · ~P). No statement is both true and false at the same time in the same sense. Excluded Middle: (P V ~P). Each statement is either true or false. People often misunderstand the meaning of this law. It does not mean that you and I know for each statement whether it is true or not; it's not a formula for omniscience. Thus, I may not know whether the animal in my backyard is a woodchuck or not, but I know that either it is a woodchuck or it is not a woodchuck. Now, the point I'm making is that, artificial experiments notwithstanding, these descriptions apply to all logical systems, including various Eastern ones, e.g. so-called Buddhist logic and even Jain logic. You may have heard that in Eastern logic the law of contradiction does not apply. This is not the case. Next time I will explain how that misconception arose and why it is false. Thanks for the fun & insightful apologetics pieces!!! I do have a couple of questions, though about the logic (4) section. you write that #2, ("It must be complete, which means that all statements that are properly a part of it must be either true or false,") must be a property of any formalization, and also that, "these descriptions apply to all logical systems". But, this can't quite be right, can it?, since #2 is true only on a bivalent system, and the latter would be false for many-valued logics? The reason I worry about this is in approaching apologetics with those who deny a classical system of logic (i.e., like many of those in phi. of language). So, while these thinkers will admit to most of the laws of logic, they would deny, for example, #2 (say, on the basis of the problem of vagueness-- Is the proposition 'Jason Alexander was bald in 1996' true or false? ); and then (like the particularist) continue to claim that things like moral propositions are vague, and so are empty of content, with the result that they cannot be universal. Phew-- how can we do apologetics while meeting the demands of those not playing on the field of classical logic? Stated as excellently as I've aways been used to from Jill. That's Dr. Jill now, of course. Actually, I'm not playing on the "field of classical logic" myself entirely, if by that you mean "Aristotelian" interpretations.Specifically, I follow Boole et al. in treating universal statements as hypothetical, for whatever that's worth. Let me try, not just to defend what I said, but to clarify the situation some more. First of all, I did allow for the fact that logicians have developed systems that do not incorporate excluded middle. I mentioned the intuitionist school, and my final paragraph included ". . . certain artificial experiments notwithstanding . . . ."
But you're right, I'm assuming a bivalent logic, according to which every statement within the system is either true or false. Furthermore, it appears to me that such is the natural way in which human beings think. It's impossible to draw logical inferences with certainty, viz. to generate theorems, if that weren't the case. That's why good old Gödel's theorem was so devastating to Russell & Whitehead and to Hilbert and other constructivists. Their projects depended on the completeness of their systems, and once it became clear that their systems could never be complete on their grounds, they had to hang them up. We can, of course, build up a trivalent system in which we add to "true" and "false" something like "unknown," "undecided", "undecidable," or "undetermined." In fact, doing so has become important in certain computer languages. Those reading this who have gone through Gensler's Logic with me, may remember that at one point we looked at truth-relations including unknowns. A bivalent truth table for P → Q looks like the one on the left; a trivalent one expands to nine rows, as shown on the right. 1 stands for "true," 0 for "false," ? for "unknown". But what have we done? Have we really introduced a new value in addition to "true" and "false"? I don't think so. All we've done is to include the fact that we don't know at times for certain propositions whether they are true or not. As I stated last time, people frequently confuse logic with epistemology. We may not know if a statement is true, but that's okay. The law of excluded middle does not say that we can always know whether a statement is true, it just says that it must be either true or false, and that also implies that it's the kind of statement that can be true or false. Obama will become president in 2008. How can we say that this statement has no truth value? If it didn't, there would be no such thing as a true prediction or a false prophecy. We just don't know what it is until some time has passed. In the meantime, we already know that either Obama will become president in 2008 or not. So, excluded middle still applies. A rather challenging example comes from the world of quantum physics. As everyone knows, light has qualities of both particles and waves. If one directs a beam of light at a screen through a barrier with two slits, the two streams of light interfere with each other. The display on the screen will show the typical formation one gets when two waves interact, a peak where both waves are at their maximum height, a trough, when both are at their lowest, and in-between areas. Such a pattern occurs regardless of whether we're talking about sound waves, water waves, or two or more Slinky coils moved side by side. So, by the end of the nineteenth century, it was pretty much established that light consisted of waves. However, Albert Einstein revived the theory that light consists of particles (the "photoelectric effect," for which he won the Nobel Prize), which he dubbed "photons." So, if you think of the beam of light going through the two slits as a collection of particles, the particles create a wave interference pattern. This wouldn't happen if you shot other particles, such as b.b's through the apparatus. Now, that's not the truly challenging part. One can say that light consists of some combination of waves and particles, for example, DeBroglie wave packets. It gets really interesting when one realizes that you can accumulate the same interference pattern sending off one photon at a time. The same phenomenon is true for electrons and other subatomic particles. Now, let us set up the equipment so that the slit through which a particle travels is determined by its "spin," such as left or right. Let's say that if goes through slit 1 if it spins left and slit 2 if it spins right. We send off one particle, and it goes on its way.We look at the screen--and see a small part of an interference pattern. The particle interfered with itself! It went through both slits, as though it's spin was both left and right. It's "easy" (if you have the knowledge and equipment) to keep this strange event from happening. All you have to do is to set up a detection mechanism that will tell you what the spin of the electron is before it encounters the barrier. Once the scientist has detected the direction of the spin, the particle is stuck with it. It will then "choose" the appropriate slit, and there will be no wave interference pattern on the screen. a) our application of the law of excluded middle is limited by the epistemological constraints on us. Let us say that I am looking at a cubist painting, and I cannot figure out what it is supposed to depict. Perhaps it's a person; perhaps it's not; perhaps it's a hybrid of a person and a chair. So I cannot say that either this is a person or it is not a person because, not knowing the artist's intention, it could be both as well. Nevertheless, I can affirm that this is the artist's creation and deny that it is not the artist's creation. The laws of logic do not confer omniscience on us. b) More specifically, and I will write more on this topic eventually, we need to come to terms with the fact that on the level of quantum mechanics as well as relativity, some fundamental categories have changed. These are not logical categories, nor necessarily metaphysical ones, but physical categories. A part of the reason why quantum mechanics has been such a problem for so many people is because they are asking questions that belong into classical Newtonian physics in a context where they are unanswerable. Physics has discovered a phenomenon that clearly cannot be explained along Newtonian lines. If we apply Newtonian categories to the state of superposition, we may get caught up in a logical muddle. The older and newer paradigms are in conflict here. But the laws of logic don't have to suffer for it. Excluded middle tells us that either the particle is in the state of superposition or it is not. If it is, then it bears the characteristics of a particle in the superposition and it does not bear the characteristics of a particle not in the superposition. No doubt, the idea of superposition is strange and violates our previous understanding of how we thought the universe should work. But that simply means that we have to expand our view of the universe, not revise the fundamental ways in which we think. Jason Alexander was bald in 1996.
a. There was a person named Jason Alexander in 1996.
b. There was only one person named Jason Alexander in 1996.
c. Jason Alexander in 1996 was bald. On that basis, false or fictional statements are either true or false because one of the crucial component propositions must be either true or false. Remember: "The present king of France is bald." Russell argued that this statement is false because statement a. is false. Now, remember that a logical system must have a syntax, viz. that there must be rules to determine what constitutes a well-formed-formula. The syntax must be such that it is possible to apply a semantic to it. Thus there are some utterances to which logic does not apply because they do not state any content. E.g., "Ouch!" or "Go ask your mother!" or "Where did he go?" Furthermore, some statements do not allow for a semantic because they are meaningless, e.g. "Your politeness is striped." With inappropriate syntax or meaningless semantics they do not allow for truth or falsehood, but how does that count against the law of excluded middle? The principles to which I referred are supposed to be the "laws of thought." If there is no thought, the laws have no relevance. What all of this boils down to is that, as I have tried to emphasize before, there is a limit to the applicability of apologetics, and there certainly is a limit to the applicability of rational argument. If someone treats logic as though which rules apply is simply a matter of personal inclination, what can one do? To insist that they must accept logic and maybe yell at them or kick them is probably a bad idea. Perhaps a better thing to do would be to point out to them that they are, in fact, using the law of excluded middle in the process of denying it. If they say that the law does not apply to all of human thought, they are committing themselves to one side of the disjunction that either the law does not apply to all of human thought or it does, and they are arguing on that basis against the other side. But I don't want to promote any formulaic arguments here. You meet the person where they are and go with them from there. Stephen Toulmin ends his book, An Examination of the Place of Reason in Ethics by saying that Bertrand Russell, after reading his account, remarked that it wouldn't have convinced Hitler. I don't have the book at hand, so I have to do this by memory, but Toulmin said something like, "Whoever thought that it would?" Finally, I don't think that we have to "meet the demands" of various skeptics. I know that you meant that phrase simply in terms of communication, but even there, I think that "believers" have allowed skeptics to set the rules for too long. We need to look for "common ground" (or "points of contact" for VanTillians), but--from a purely philosophical, not evangelistic perspective--there's no reason why we have to let the skeptic tell us where that is. But that's for another time. Hope that helped. I will move on from here to Buddhist and Jain logic whenever I get a chance. We left off with my declaring that we can rely on logic for help in discovering truth. I promised you that I would talk about Buddhist and Jain logic because many people claim that they dispense with the law of contradiction, but I need to start with Hindu logic first. Not all of Hinduism conforms to the canons of logic. Take Advaita (non-dual) Vedanta, for example. The monism, according to which there is only one reality, Brahman, which is at the same time a multiplicity of beings, maya, cannot escape the fact that it is contradictory. (See the section on pantheism in chapter 5 of No Doubt About It.) But the fact that Shankara used logic to try to show us what is beyond logic does not mean that there is no logic in Hinduism. For Hindu logic, we should consult the Nyaya school of Hindu philosophy, which is the school of logic. Specifically, let us look at what we see in the Nyaya Sutra, ascribed to a certain Gotama (or Gautama) Akshapada ("Gotama with Eyes on his Feet"), not to be confused with Gautama, the Buddha. I wish I could walk you through any number of aphorisms, but I will just point out a few that demonstrate that Hindu logic (in contrast to some beliefs that Hindus may hold) is as straightforward as "Western" logic. It clearly affirms the law of contradiction, and it recognizes the key to any valid argument, which in a syllogism we call the rule of "distribution of the middle term." 73. . . . it is stated that if perception and other means of right knowlege are impossible, the denial of them is also impossible. 74. Moreover, the denial itself cannot be established if you deny all means of right knowledge. 75. If you say that denial is based on a certain means of right knowledge, you do thereby acknowledge the validity of the means. The monkey ate the snake. The tiger ate the goat. Therefore, the cow ate the grass. The monkey has big ears. Therefore, the monkey is an elephant. This one looks more like a valid argument than the first one, but it isn't. There needs to be a link between the first two sentences. Instead, there's only a pretend-link. We call the link in Western classical logic the "middle term." In this case "having big ears" is the middle term. For a syllogism to be valid, the middle term has to be all-inclusive for the object in one of the premises, so that having the property described by the middle term automatically assigns the second object into the same category as the first object. E.g. All pachyderms have big ears. Therefore, all elephants have big ears. In this argument, "pachyderm" is the middle term, and in the first premise we have a universal reference to it: All pachyderms. We say that in this case the middle term is "distributed," whereas in the previous example it was "undistributed." 36. A homogeneous (or affirmative) example is a familiar instance which is known to possess the property to be established and which implies that this property is invariably contained in the reason given. 37. A heterogeneous (or negative) example is a familiar instance which is known to be devoid of the property to be established and which implies that the absence of this property is invariably rejected in the reason given. Different wording. Different context. Ultimately the same principle. My point, of course, is that invoking "Eastern Logic" does not get anyone out of the cogency of a sound argument. That's true in an Eastern context, and it's certainly true in a Western context. There are no geographical limitations to illogic. Buddhism and Jainism make things a little harder on themselves, but for them, also, the bottom line remains the same, as I hope to show shortly. Now, for the big question: Does playing the "Buddhist logic" card get you excused from the law of contradiction? Of course not, and certainly not if you don't buy into Buddhist metaphysics. The Buddhist view of the world is based on the notion of "dependent origination," the original Sanskrit term being the pithy phrase pratityasamutpada. Let's agree among ourselves to call it DO. DO is the ultimate in bootstrapping. That means that one creates a coherent picture out of a hypothetical assumption. Every part of the picture appears to be real, but none of it is, except insofar as it relies on all of the other details that arise from the assumption. In the final analysis, if you will forgive my switching metaphors, it's a house of cards. "But you don't have a car." "That's right, because somebody stole it." "But you didn't have a car before someone stole it." "Again right; after all, why would I get a car if someone was just going to steal it?" "But how did you know that someone was going to steal it?" "Well, that's easy, because I didn't have a car." "But why didn't you have a car?" "I already told you: somebody stole it." Try this: Go to Excel and see if you can get a value of "1" into cell A1 without typing it into the cell. Well, that's easy, all you have to do is type "=B1" into cell A1. Unfortunately, if you have not typed a "1" into B1, you'll just get a value of "0" into A1. So, you have to give B1 the value of "1." Can you do that without typing it in? Sure you can. Just type "=C1" into B1. But, unless C1 already has a value of "1," that doesn't help any. You just get zeroes in A1 and B1. You can either type it in or say "=D1." But, of course, that doesn't work either, unless you've already given D1 the value of "1" earlier. You have two choices: either type it in or keep referring back hoping that will work. I guarantee you, it won't. For that matter, you can't just let A1 fill itself with the value "1." Nor can you at any point allow the chain to refer back to itself and hope to get a "1" that way. Unless you have a cell somewhere that provides the value to the chain of cells without receiving it from any other cell, you won't get a value into any cells. This is not a circular argument; it is a transcendental argument of the kind: Unless condition B is met, you cannot attain condition A. Here's the deal. My illustration notwithstanding, DO is precisely what I'm arguing against there: a self-referential spread sheet. Each value depends on each other value, but there's no external cause for any of the values. Furthermore, the values are forever changing, and, thus, there is no single cell which really has reliability except as a function of the entire fortuitous nexus. It is sometimes referred to as "Indra's Web." I don't want to argue about this metaphysical point now. Obviously, I think it's problematic, but my point has to do with regard to its implications for logic. If reality is nothing more than DO, then logical relations have no foundations in this gigantic illusion. Let me exemplify how this works out by quoting again from the Hindu Nyaya Sutra, which sets up the Buddhist propositions as a foil for its arguments. These propositions are from book 2, chapter 1. The "objector" appears to come from a Buddhist perspective. 69. Perception and other means of knowledge, says an objector, are invalid as they are impossible at all three times. 70. If perception occurred anteriorly it could not, he says, have arisen from the contact of a sense with its object. 71. If perception is supposed to occur posteriorly you cannot, he continues, maintain the conclusion that objects of sense are established by perception. 72. If perception were simultaneous with its object there would not, says the objector, be any order of succession in our cognitions as there is no such order in their corresponding objects. Gotama, author of the Nyaya Sutra, goes from there to show that this understanding is self-refuting, but, again, I don't want to criticize the metaphysics at this point, but show its implications for logic. What we see here, then, is that the ephemeral, boot-strapping nature of the world makes a genuine conection between the human mind and apparent reality impossible. Thus, I may make a logical inference, but, when it comes right down to it, its reliability will be dubious, and I may be stating something false. Best not to ascribe any certainty to our logical inferences then. But are you catching what is happening here? Because of DO and the transcience of the apparent world, we need to guard ourselves against making logical inferences lest we infer something that is false. But that caution would not mean anything if it were not for the all-important difference between truth and falsehood. Buddhist philosophy--even Buddhist logic--shies away from what we might consider normal logical inferences, not because it does not respect the law of contradiction, but intentionally because it wants to keep us from making false or contradictory statements. In the phenomenal world of our everyday lives, logical arguments have their normal place. In the metaphysical understanding of the universe as nothing more than DO, logical arguments are likely not to correspond to reality and must, therefore, be very carefully circumscribed. In either context, the law of contradiction is what guides us in assessing what we may or may not say. Remember, the law says that nothing can be both true and false at the same time and in the same sense.It is this distinction that Buddhist logic also seeks to preserve. Buddhist logic has us distinguish between two different perspectives. Jain logic, as we shall see next time, thinks that there are far more than two points of view we need to take into account. No one goes to greater length to protect the law of contradiction than Jain philosophers. That statement will seem very odd to you if all you've heard about them is that they say things like: "The jug exists and it does not exist." But there's a whole lot more to it. Ahimsa: Never to harm any living being. Always to tell the truth. To avoid sexual relations (or, in the case of lay persons, to be faithful to your spouse). Not to let yourself get attached to anything. The vow always to tell the truth rules out saying something that may technically be true, but is actually misleading or false. Thus a Jain must take all different perspectives into account and qualify what he says in order to avoid any implicit lie. Last night we saw that Buddhism tries to take account of two different perspectives: lived phenomenal existence and the underlying reality of dependent origination. Jainism maintains that two is far too few. There are many more ways of looking at reality, and a statement may be either true of false dependent on which perspective we take. I will try to keep things simple and just mention a few of them. Let's say we are making a statement about a jug. You can look at the jug simply as an instance of being. You can look at the jug as so much treated clay. You can look at the jug as a container for water. You can look at the jug as so many atoms. You can look at the jug as not being a non-jug. You can look at everything else in the vicinity of the jug that is not a jug. Again bypassing the self-referentially dubious nature of the above statement, the point should be clear now: So-called "Eastern Logic" makes things a lot more complicated than our Western abstractive systems do by taking account of different perspectives, but--despite occasional appearances to the contrary--it does so in order to maintain the principle of contradiction as absolute. Part 5. It's not all about Debates. Martin Luther and Johann Eck debating in 1518. I have met quite a few people who, as soon as I use the word "apologetics," think about public debates, particularly ones involving Norm Geisler, Bill Craig, John Warwick Montgomery, or Gary Habermas. These people frequently have a negative reaction to the debates and the debaters. The Christian apologists are allegedly too harsh, too aggressive, too argumentative, too convincing, and not cutting their non-Christian opponents enough slack. I find this attitude extremely bewildering. Personally, the Lord has not called me to a debating ministry as he has some of my friends, though there have been a few times when I couldn't avoid participating in one, and--if may state in all honesty and humility--I held my own quite nicely. Come to think of it, one occasion comes to mind when I, too, was reproved by someone simply for making my arguments too cogent. This is really weird. But that's not my calling. Nevertheless, other people are called to participate in debates, and--on the whole--that's a good thing. It seems to me that, if a Christian is called to debate against a non-Christian that first of all, he or she should do all they can to know the position of their opponent, if possible, better than the opponent himself, and then--without going ad hominem-- exposing the flaws in the non-Christian's position and showing how Christianity is more rational than other world views. Unfortunately, nowadays "to disagree" and "to hate" are virtually synonymous in some circles, but that piece of semantic misinformation has to remain the problem of the occupants of those circles. If someone doesn't want to take the risk of having their arguments shot down, they shouldn't agree to be a part of a debate anyway. J. W. Montgomery evoked a lot of criticism from Christians after his crushing debate with Thomas J. J. Altizer of Death-of-God fame, but Altizer himself was not put out. If you hold a position as bizarre as Altizer's, you have to expect to lose debates. Nonetheless, according to Montgomery, Francis Schaeffer attempted not to arouse antagonism, but to be kind, gentle, and conciliatory when he debated the heretic Bishop Pike. Unfortunately, people came away under the impression that Schaeffer and Pike believed pretty much the same things. Now, that's a serious problem. So, conversely, if you don't want to take the risk of people being angry at you for shooting their arguments down, you shouldn't agree to be a part of a debate either. But actually this is all beside the point. What I really want to say is that public debates are one of the rarest opportunities to use apologetics. Chances are that most of us never will have occasions to debate on a grander scale than the local village atheist, and he's probably so irrational that debates with him are pretty much worthless. It's in a one-on-one setting that apologetics is going to be much more likely a crucial instrument in undergirding evangelism. And, if you talk to a non-Christian acquaintance, it's very unlikely that you can study his books beforehand so that you know his positions. It is true that there are a number of routine questions that almost always come up, but when it comes to individual belief-systems, there's no telling what a person may actually think is true. And that means that to be a good apologist, you can never stop studying. So, how should one prepare? More on that next time. Part 6. When they say this, you say . . . .
". . . it's a mystery, but you're going to hell if you don't believe it." Many years ago, on a plane trip to Israel with Wandering Wheels, a student was "witnessing to" (aka "getting into an argument about religion with") the young lady sitting next to him. Pretty soon he got stuck in the conversation, so he excused himself, got up, found me a few rows back, and asked me how he should respond. I gave him a couple of ideas, he thanked me and went back to resume his conversation. A few minutes later he was by my seat again. "Now, she's saying such-and-such, what should I say now?" Having listened respectfully to my advice, he headed back to his conversation partner, only to show up at my seat for further assistance a short while later. The young lady to whom he was talking must have thought that this was really weird. I thought it was. In my earlier years at Taylor, a number of students taking the World Religions class thought it would be a "practical" course where they didn't really study the religions, but would basically be taught scripts to use in witnessing to adherents of various religions. In other words, they wanted easy answers to questions that they would not necessarily even understand. Oh, the complaints about having to memorize information back then! But that was more than twenty years ago. I trust you're getting the point I'm aiming for. Apologetics conversations should never be scripted. One of the points that I do like about John Stackhouse's book Humble Apologetics is that he encourages us to say "I don't know" at times when we don't know. A memorized or scripted answer is not very helpful to anyone, though I also think that there are some items for which an "I don't know" is inappropriate and that my list of such items would be considerably longer than Stackhouse's. So how should we prepare for meaningful apologetics? Here is my answer: Stop studying apologetics! Are you still breathing? Then let me hasten to clarify: Don't just study in order to find arguments for Christianity or against non-Christian points of view. If you study a discipline or a piece of writing only to find fault with it, chances are that you'll never really understand it and will consequently be less likely to address it with credible arguments than if you had studied it in its own right empathetically first. When you read a statement that seems obviously absurd, ask yourself how the author, who probably was an intelligent human being, might have meant it (though there may be a good chance that even doing so will not really make the absurdity go away). If you care to, look at my PowerPoint on pantheism (posted below temporarily) and see how I tried to give the pantheist a chance to respond several times, though ultimately the contradiction remained. Click here. By all means, study No Doubt About It, but to become a good apologist, you need to study the backgrounds of what's behind my various arguments. Don't just learn the answer to alleged textual problems in the Bible, but study textual criticism. Don't just learn the reasons why the trinity and incarnation, as formulated by the early church, aren't irrational, but study the "church fathers" for all that they taught. Don't just learn how to respond to a Muslim, but study Islam. Don't just learn three arguments why atheism is an inviable world view, but study prominent atheist authors of the last two centuries for their contributions as well as for their flaws. I may be going out on a limb here, or maybe I'm really naive, but it seems to me that if you know the subject matter, the apologetics aspect of it will emerge naturally. To use another example, if you are truly informed in Greek mythology there should be no question that the life and work of Jesus couldn't have been fiction derived from Greek parallels. Or, to ride one of my hobbie horses, if you learn the whole story of Krishna, you will realize that it is impossible to find meaningful (viz. non-trivial) similarities between Krishna and Jesus, let alone identity. Thus, what I'm trying to get at is that, if you study a certain field you should do so to learn about that field, and in doing so you're also preparing for apologetics. Thus, if you study English literature, you're learning about English literature, but you're also preparing for apologetics; if you study physics, you're learning about physics, but you're also preparing for apologetics; and so forth. Now, I'm certainly not seriously advocating giving up the study of apologetics or to ceasing to write or read apologetics books. But the contents of apologetics books are by their very nature drived from other disciplines--history, philosophy, biblical studies, etc. Keep in mind that all the analysis and argumentation that goes into such a book originated with people who were genuine experts in their fields of knowledge. So my closing statement for this entry is: Go beyond apologetics in your studies, so that you will become a better apologist. I think I've now addressed the various aspects of meta-apologetics that I said I would. I'm ready to return to Samuel, but I also can stretch this out a little further if anyone wants to ask specific follow-up questions that may be of general interest. 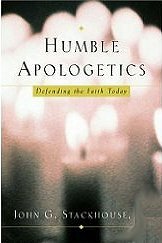 1John G. Stackhouse, Humble Apologetics (New York: Oxford, 2006), pp. 164-65. Back to text. 2Robert D. Baird and Alfred Bloom, Indian and Far Eastern Religious Traditions (New York: Harper & Row, 1971), p. 42. Back to text. 3C. S. Lewis, "Learning in Wartime" in The Weight of Glory (New York: Macmillan, 1980), p. 28. Back to text. 4Although undoubtedly I carry a much larger version of such a "notebook" in my head these days, I hope I'm still more flexible in providing answers. But I'm getting old5 and have traded in all of my creativity for memorizing the train schedule and for counting peas while moving them from one bowl to another, and I probably shouldn't have thrown a polar bear at Cat. (reference for the first two items anyone?) Back to text. 5 Okay, I will happily cave in to public pressure and concede that I'm neither old nor getting old. [Sorry, Adam D., I remember that I told you that you can't put a footnote inside a footnote, and that's still true. It just doesn't apply to my blog. Here I can do the impossible.] Back to text..
Feel free to send me a note!